A source of peace comes at sunset here in the mountains. Skies fade from turquoise, orange and fiery reds to purple. Palm fronds frame the scene spectacularly, sharp and distinct. If I step out on the promontory near Sove’s house, I can see Gran Riviere, I can follow it towards Leogane, I can see, far away, the lights that are - that can only be - Poprens, the capital. I look forward to this time. Looming black birds - Sonel tells me they are “hawks” - begin caw-cawing —children are playing (still!) noisily in the flat yard. I hear the singing, from down the tricky path from the latrine, through the igname, sweet potato vines, huge manyok, taro leaves and fallen banane. Free of burdens, the girls are strong and their voices rise to meet the top of the kokoye. Their bare feet pummel the dust as they jump rope, an de, twa ansanm, the three youngest girls vie for first place. First Dieula, then Wozanna, then Jezi. An, de twa, an de twa. Nana joins in, breaks the rhythm, all giggle. Ou pedi, ou pedi! You lose! Drawn by their chants and giggles, I carefully descend the path. It’s a hazardous descent - I must not fall - but worth the effort. 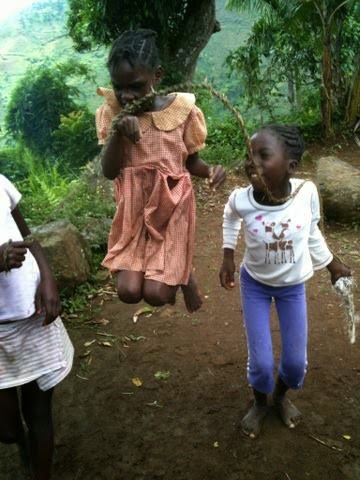 I am party to their childhood, in the hills of rural Haiti; it’s is a surprise to me and I feel honored. Golden tinctured moments few others share, with the families in the mountains. But of course, the girls want photos, want to see themselves, and I get to share in their squeals, their delight. There is only a little light left now, and the children reluctantly leave off their games. Squabbling, who won the most, who jumped the most, who lost. Jezi grabs the rope, winds it on her arm. They scatter, down to Kay Madame Jean, Kay Gistav, up to Kay Sove’s.